Because Halloween is one of my favorite holidays, I thought it would be fun to do a DIY costume post.. with a twist! I definitely think women have more of a variety to choose from when it comes to easy yet creative DIY costumes. 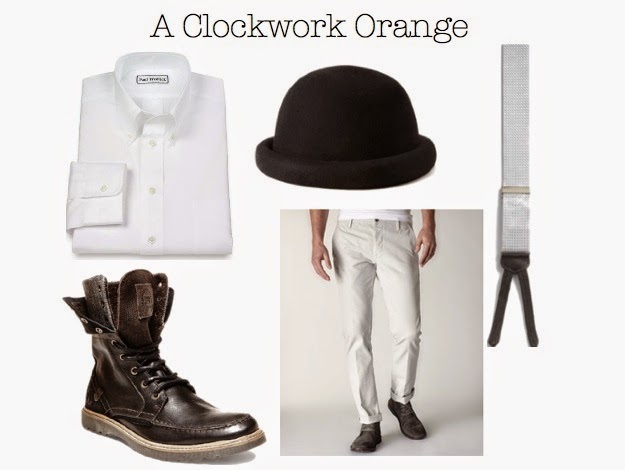 So today's post is for the guy in your life - but the great thing about this classic Clockwork Orange costume isn't that it can be put together with just a few key items (although that's a plus), it's that the ladies can use it as inspiration too! It's such a simple look and so easy to tailor to both men and women. You're ready to go with just a crisp white shirt, white pants, some suspenders and a bowler hat! What are some of your favorite couples costume ideas?